The VOCAL VCSE Leaders Forum in Salford have come together to create a Manifesto for the voluntary, community and social enterprise sector. 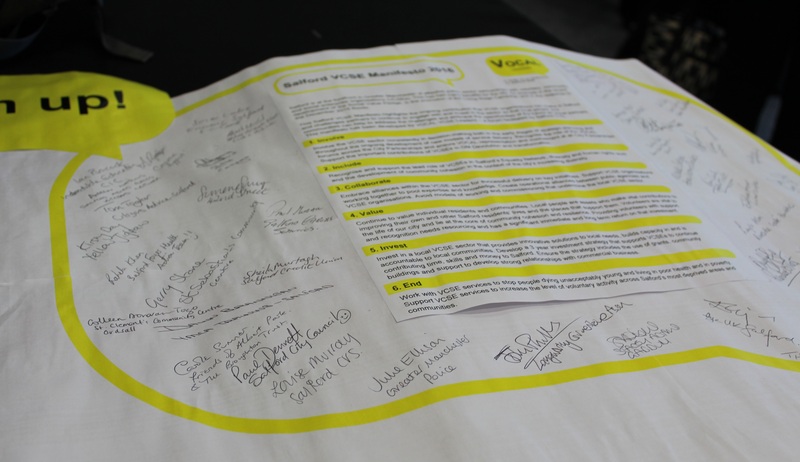 We have developed a VCSE Manifesto to highlight the ongoing contribution that VCSE organisations can make in Salford. The Manifesto is designed to clearly encapsulate what we think are the key messages we want to make, particularly to public sector colleagues. It challenges partners to effectively engage with and invest in the sector so that local people and communities can help to address the challenges and embrace the opportunities of the future as equal partners. The Manifesto comprises 6 ‘asks’, described below, and we are now urging colleagues from the VCSE sector, public sector and the private sector to sign up! Please email gill.bruder@salfordcvs.co.uk if you would like to be added to our virtual list of signatories. You can also download a copy of the Manifesto here to print off, sign and display within your organisation. Involve the VCSE sector consistently in decision-making both in the early stages of strategic planning and throughout the ongoing development of new models of service delivery. Recognise the role of the VOCAL forums across the City Partnerships and ensure VOCAL representation and involvement at all City Partnerships. Support the important contributions of VCSEs in GM Devolution and transformation. Recognise and support the lead role of VCSEs in Salford’s Equality Network, diversity and human rights work and the development of community cohesion in the context of the city’s increasing diversity. Embrace alliances within the VCSE sector for successful delivery on key initiatives. Support VCSE organisations working together to pool expertise and knowledge. Create operational alliances between public agencies and VCSE organisations. Avoid models of working and commissioning that undermine the local VCSE sector. Continue to value individual residents and communities. Local people are assets who make vital contributions to improving their own and other Salford residents’ lives and the places that support them. Volunteers are vital to the life of our city and lie at the core of community cohesion and resilience. Providing volunteers with support and recognition needs resourcing and has a significant immediate and long term return on that investment. Invest in a local VCSE sector that provides innovative solutions to local needs, builds capacity in and is accountable to local communities. Develop a 3 year investment strategy that supports VCSEs to continue contributing time, skills and money to Salford. Ensure the strategy includes the use of grants, community buildings and support to develop strong relationships with commercial business. Work with VCSE services to stop people dying unacceptably young and living in poor health and in poverty. Support VCSE services to increase the level of voluntary activity across Salford’s most deprived areas and communities.